Star Trek regularly elicits lovely gales of laughter. Looney laughter more your style? Whatever your particular laugh vibe, the sci-fi legacy of Gene Roddenberry delivers the chuckles. It turns out the future space race, celebrated for its intellectualism, also reigns as sci-fi comedy king. 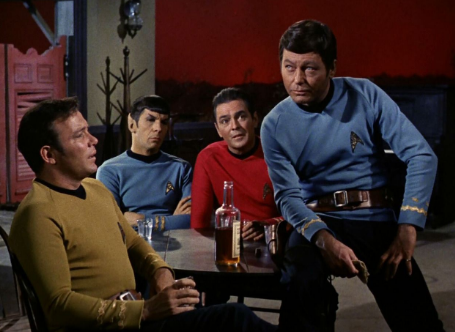 No matter what show you love – from The Original Series with Captain Kirk to the CBS All Access series, Star Trek: Discovery with Captain Pike – loyal Trekkers end up being consistent laughers. Thanks, Zephram Cochrane. We always love hearing the title of a movie spoken in the dialogue! Indeed, star trekkers all seek out new life forms and new civilizations – and also explore fascinating ways to laugh hard. With a long established entertainment institution such as Star Trek, it would be impossible to include ALL really funny folk. One would need to jump into time warp to cover it all. Accordingly, this piece will focus only on regular series characters. Guest stars like mischievous Q, played by the wonderful John DeLancie, or Guinan, fleshed out by Oscar winner Whoopi Goldberg are funny fictional folk, but they’re not regular cast members. 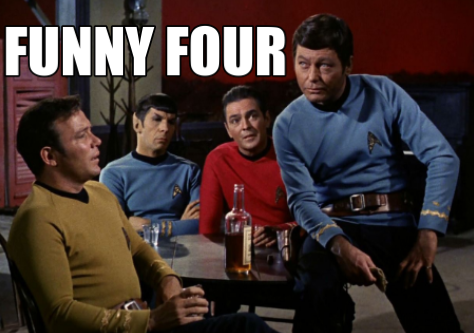 Here now are the Fantastic Four of Trek laughter. He’s the man, the myth and the motivator. James T. Kirk may have been enemy of the Klingon race and he who defined Cowboy Diplomacy, but he was also quick with a one liner and he knew funny when he saw it. In episodes like Trouble With Tribbles and A Piece of The Action, Captain Kirk deals with prodigiously pregnant beasties and aliens who make Tony Soprano look positively harmless. Even when he’s fighting – like in his fist fight in Shore Leave with arch enemy Finnegan – Kirk leaves us tickled. When first officer Spock is being his most Vulcan, his Captain knows just what comedic buttons to press to leave his friend flustered, and us more than slightly amused. When you come from two races, two worlds and two cultures, you’ve got two perspectives. Perhaps that’s why Spock rules over the sharp retort. No matter who’s recipient of his venomous Vulcan verbiage, Spock toasts and roasts you where you stand. In the legendary episode, Amok Time, he must come to grips with the manipulative T’Pring. When he tells her off by saying, ‘You’ll find that wanting is not the same thing as having.’ we chuckle at the raw truth of his summation. Spock’s comedic dance with Dr. McCoy is the stuff of comic nirvana. In STII: The Wrath of Khan, Spock tells Bones, “Doctor, you must learn to govern your passions – they will be your undoing.” All good Spock, but please don’t stop the flow of cosmic comedy. Physician, heal yourself with the soothing balm of laughter. Dr. Leonard ‘Bones’ McCoy rules his Enterprise Sickbay with a mirthful bedside manner. Bones can trade quips with the best of them, and does so on a regular basis. However, it takes a real comedian to make light of your impending death. In the classic, Space Seed, as the villainous Khan holds a scalpel to his throat, McCoy instructs him just how quickly and easily Khan can dispatch him. It not only earns respect from Khan, it gives us another chuckle from the old country doctor. Dr. McCoy’s favored comedic sparring partner is, of course, that green blooded Vulcan. When Spock implants his Katra – or soul – into the good doctor at close of Wrath Of Khan, it’s the ultimate joke played on his frenemy. From then on, no matter how surly and frustrated Bones may become with Spock, he’s now a part of him – and vice versa. As Scotty tells Mister LaForge (Levar Burton) in the TNG episode, Relics, he’s spent his entire career figuring out crazy ways to do things. That alone gives him prime comedic pedigree. Scotty is an engineer – in both tech and the funny. Actor James Doohan who created the original Chief Engineer Scott was also a master of voices – providing computer or alien voices in various episodes. The agile vocal gymnast also performed a few Star Trek Pocket Audio Books. All that comic flavor in his voice impressed all fans of comedic Trek.